After a string of three consecutive second places, Peter Sagan (Tinkoff-Saxo) finally broke the drought that has lasted since March when he won the uphill sprint on the fourth stage of the Tour of California. With a powerful surge on the short finishing straight, he passed late attacker and former teammate Daniel Oss (BMC) just metres from the line and held off Wouter Wippert (Drapac) and a fast-finishing Mark Cavendish (Etixx-QuickStep) to take the win while Tom Skujins (Hincapie) defended the overall lead. 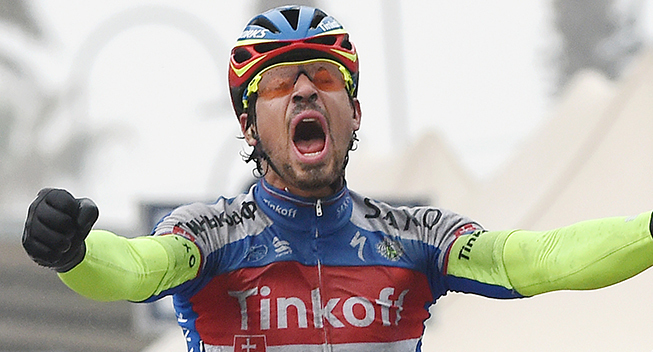 With 11 stage victories, Peter Sagan has a great track record in the Tour of California. However, like the rest of his first season at Tinkoff-Saxo, the 2015 edition of the American race has been a frustrating experience. In the first three stages, the Slovakian had finished second and he knew he faced an uphill battle if he wanted to break the string of near-misses in stage 4 which was expected to end in a bunch sprint. With a more technical finale and an uphill finishing straight, he had a better chance than he had had in the first two sprints. Those two factors and a fatigued Etixx-QuickStep team were in his favour as they headed into the sprint and this time there was no one denying Sagan who took his second victory since he joined his current team at the start of the season. Sagan had tried to split the peloton in the crosswinds but things calmed down with 12km to when they turned into a headwind. Yves Lampaert (Etixx-QuickStep) and the Hincapie riders hit the front to calm things down and with 10km to go, Hincapie ended a day of hard work. It was now Stijn Vandenbergh and Martin Velits who strung things out for Etixx-QuickStep. Velits ended his work, leaving it to Vandenbergh to ride on the front until Jelly Belly took over with 4.5km to go. The Belgian team stayed attentive in the other side of road before they again took control with Guillaume Van Keirsbulck. The impressive classics specialist set the pace until Tinkoff-Saxo hit the front with Jay McCarthy just before they passed the 2km to go mark. Julian Alaphilippe (Etixx-QuickStep) moved to the front for the Belgians followed by Matteo Trentin, Mark Renshaw and Cavendish. Trentin took over and rode on the front until Oss attacked just before the flamme rouge. Giant-Alpecin started to chase before Trek took over with their train and they gradually closed the gap to Oss. However, the Italian was still ahead when he took the final turn with 250m to go. Race leader Toms Skujins finished safely in the bunch and so defended his defended his overall lead. Courtesy of bonus seconds, Sagan reduced his deficit to 22 seconds but the Latvian will again wear the yellow jersey tomorrow in stage 5. The lumpy course is made for attacks as it is almost always up or down with three categorized climbs before the riders hit the long, gradual uphill drag to the line. After yesterday’s climbing, the riders were back in flatter terrain for stage 4 which brought them over 173.1km from Pismo Beach to Avila Beach. After a flat first half, the riders tackled a small category 3 climb at the midpoint before they got to the flat finale where only the wind was expected to potentially could do some damage. All riders who finished yesterday’s stage took the start in nice weather conditions and they got the race off the usual fast beginning. Lasse Norman (Cannondale) was the first rider to get a small advantage and when he was brought back Will Routley (Optum) gave it a go. The Canadian didn’t have any luck and after a MTN-Qhubeka rider had briefly been off the front, Ruben Zepuntke (Cannondale), Matt Brammeier (MTN-Qhubeka), Thomas Soladay (Optum) and Oscar Clark (Hincapie) got clear. However, that move was brought back after 14km of racing. As they approached the first intermediate sprint, Gregory Daniel (Axeon), Kiel Reijnen (Unitedhealthcare), Jesse Anthony (Optum) and William Clarke (Drapac) attacked and they quickly built and advantage of 10 seconds. Meanwhile, Sep Vanmarcke (LottoNL-Jumbo) and Daniel Teklehaimanot (MTN-Qhubeka) took off in pursuit. Daniel beat Reijnen and Clarke in the first intermediate sprint while Teklehaimanot distanced his companion who was brought back. The peloton slowed down and after 21km of racing, the escapees were 1.40 ahead of the peloton while their chaser was at 20 seconds. Teklehaimanot had to work hard but at the 38km mark, he finally joined the leader who were now 3.15 ahead of the peloton. A little later, Daniel beat Teklehaimanot and Clarke in the second intermediate sprint. The crosswinds was taking its toll on the peloton and five riders, including representatives from Novo Nordisk, Jelly Belly and Xabier Zandio (Sky), went down in crash. However, they all managed to rejoin the peloton. At the 50km mark, the gap was only 2.40 as the Hincapie were working on the front. They allowed the cap to go out to 3.20 as they reached the feed zone. Etixx-QuickStep were now also coming to the fore to assist with the chase and they kept the gap around 3.30 as they hit the only climb. Meanwhile, Alexander Braico (Jelly Belly) and Travis McCabe (Smartstop) went down in a small crash. The escapees lost ground as they started to climb and when Anthony led Clarke, Reijnen, Daniel and Teklehaimanot, the gap had come down to 2.30. That allowed Etixx-QuickStep to take a small breather and with 74km to go, the gap had again gone out to 3 minutes. Hincapie rode harder as they had finished the descent and with 65km to go, they had brought the gap down to 2.30. Etixx-QuickStep again started to work with them and it was Yves Lampaert and Martin Velits who had been given the task of working for the Belgians. Those two riders swapped turns with two Hincapie riders to keep the gap stable at around 2 minutes before they entered the final 55km where the peloton got significantly more nervous due to the windy conditions. 4km later LottoNL-Jumbo made the big attack in the crosswinds when Maarten Wynants, Tom Van Asbroek, Sep Vanmarcke and Robert Gesink hit the front. The former three traded pulls with Matti Breschel (Tinkoff-Saxo) but the attempt didn’t work. Hincapie went back to work but the acceleration had brought the gap down to 1.20. At the same time, the peloton had got very nervous and all the big teams were amassing at the front. Velits and Lampaert also got back on the front as the gap had come down to less than a minute. The peloton calmed down and so Etixx-QuickStep and Hincapie kept the gap around one minute for a while. They even got some assistance from Cannondale who asked Norman to join in on the pace-setting. There was no big stress and this allowed Mark Renshaw to calmly return to the peloton after a mechanical. Meanwhile, Daniel led Clarke and Reijnen across the line in the final intermediate sprint. A little later Daniel made the first attack from the front group and he was countered by Anthony and Clarke who briefly got clear. However, the group was back together with 30km to go. The calmness didn’t last for long as Daniel tried again and this time only Clarke could keep up with him. Teklehaimanot, Anthony and Reijnen never made it back and they were swallowed up by the peloton. Daniel was relentless and he attacked again, distancing his Australian rival. Meanwhile, Lampaert, Velits, Norman and a couple of Hincapie riders kept the gap at around 30 seconds. Daniel was riding surprisingly strong and managed to extend his advantage to 1.20 with 25km to go. This forced Etixx-QuickStep and Hincapie to ride a lot harder while Norman again disappeared from the front. Clarke decided to sit up and with 20km to go, he was back in the bunch. Meanwhile, Lampaert was taking some huge turns in the peloton and the fast pace created some splits as a few riders were distanced in the crosswinds. Daniel was digging deep but he was losing the battle. With 13km to go, he was just a few metres ahead and this was the signal for Tinkoff-Saxo to make a big attack. Peter Sagan, Jay McCarthy, Matti Breschel and Daniel Oss (BMC) got a gap but as the Dane could not keep up with his teammates, Matteo Trentin (Etixx) managed to bring it back together. Daniel was caught in the process.